How do you create group discount ticket types? If you are planning to offer a special discount rate for Group Discount Ticket Purchase, you can simply create a separate ticket type for group discount purchase. This tactical promotion is useful to incentivise ticket buyers to bring more friends or people together to the event. Just go to the event admin, Under the "Create Tickets" tab. 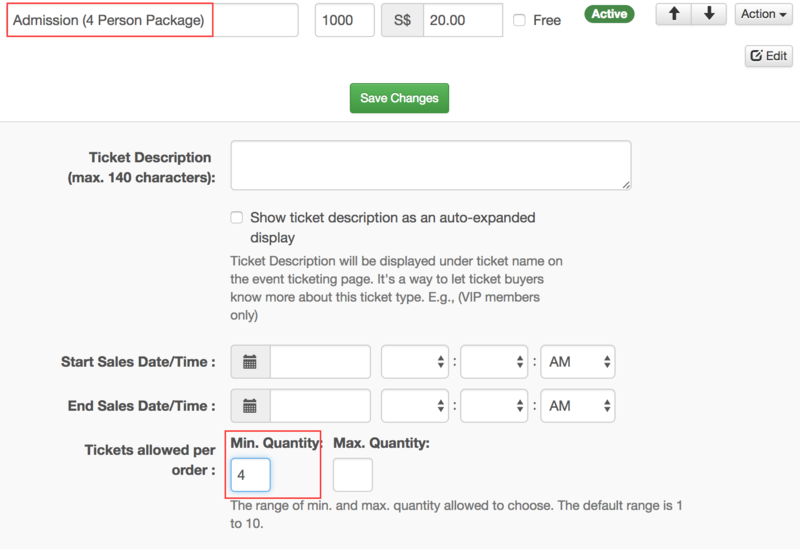 For example: You can create a new ticket type named "Admission(4 Person Package)" and Set Minimum Quantity to 4 in Tickets Allowed Per Order setting as shown in the picture below. The minimum quantity setting will enforce users to buy a minimum of 4 tickets when they select that group discount ticket. The following screenshot is an example of where to set the minimum quantity per order. If you need any further clarification, please do not hesitate to contact us at hello@eventnook.com.